Soccer Shots is the premier “intro to soccer” provider in North America, offering principled, fun instruction to children 3-8 years old. 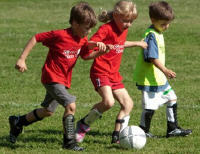 Our creative curriculum emphasizes soccer skills as well as character development, which transcends the game itself. We are motivated by a desire to see children experience the game of soccer and to enjoy the rewards that participation in the game offers. This approach to teaching children soccer combined with a proven, systematized business model defines Soccer Shots. There is a purpose and a reason for everything we do at Soccer Shots all of which comes directly from our own love of soccer. We have a deep appreciation for the positive character traits we've developed through participation in the game. Our commitment to excellence, quality, and safety are considered when selecting directors and instructors updating national curriculum and program training materials. All Soccer Shots participants are treated with dignity, respect, and care and are expected to treat each other the same way. Sportsmanship, teamwork, good attitudes, obedience, and understanding of the concepts and rules of soccer take precedence over competition and winning. Our mission is to provide your child with creative, simple play activities which will enable your child to exercise and have fun with the world's most popular game: soccer! Jeremy Sorzano and Jason Webb met as teammates while playing soccer both in college and professionally. They formed Soccer Shots in 2000 when looking for a way to make some side money in the off-season. They shared an entrepreneurial spirit, a deep love of soccer, and a passion to inspire children to live fit and healthy lives. In May of 2009, Justin Bredeman became the third partner bringing with him 8 years of experience from Auntie Anne’s Inc. a pretzel franchising company where he led a team that supported nearly 800 franchise units. His deep understanding of the franchise business model also comes from the knowledge gained from his 3 years of owning and running a Soccer Shots territory.